Like children hitting suspended golf balls with a stump, or copying Glenn McGrath’s broad-chested approach to the wicket, or working on a flipper in the backyard, cricketers of almost every level daydream about captaining Australia. Just how far into the future did Smith dream that day might come? Given it wasn’t that long ago that winning a place back in the team was his highest priority, you can’t imagine Smith saw any captaincy aspirations materialising so quickly. While he mightn’t have known it, it was on his doorstep, readying to ring the bell. By the time the Australian team returned home from its third consecutive Ashes series defeat in England, the team was Smith’s. The job in front of him was enormous. The 2015 Ashes Tour would be the Baggy Green swansong for no less than five senior players: Ryan Harris before the Tests even started, skipper Michael Clarke, opener Chris Rogers, wicketkeeper Brad Haddin, and allrounder Shane Watson. Two Tests into the Australian summer, those five were joined by tearaway fast bowler Mitchell Johnson. 365 Tests worth of experience had left the dressing room in little over four months. At this point, Smith might have been excused for wondering what he’d got himself in for. Not since Allan Border took over from Kim Hughes – with two rebel tours to South Africa to follow – has the rebuild of the Australian cricket team loomed so large. The Australian cricket team has handled the end of careers impressively for two decades. Long-serving players are given their plaudits and send-offs; new careers in the media or franchise Twenty20 tournaments materialise. Occasionally they get it wrong, and the examples of Border himself, Ian Healy, and Jason Gillespie stand out. All three were good enough to play away on tour, but when the Australian team next reconvened on home soil, suddenly they went the way of cans of baked beans and Sydney-to-London consumption records. Retirement by press release is never a good look. But what has been managed well is generational change. In my lifetime, there had only been two major retirement ‘events’ in which multiple big names have departed the scene at the same time. Back when I was a lad, it was a sad day to realise that I’d never watch Dennis Lillee, Greg Chappell, and Rodney Marsh play in the Baggy Green again. Two decades and a year or two later, it was much the same feeling when Glenn McGrath and Shane Warne called time, too, with Justin Langer in tow and with Damien Martin escaping out the side door during the Ashes series a few weeks earlier. In both cases, the impact on the Australian team was both immediate and long-lasting. Several years of regeneration and rebuild followed for the Aussies to return to the top of the heap. Steve Smith finds himself at the helm of a third major retirement event now, and the reno job ahead of him involves structural changes and a kitchen fit out, not just a patio addition and bathroom re-tile. It’s not quite a complete knock-down-rebuild, but it’s about as close as any Test captain would want it to get. It’s Allan Border-esque, and Smith might be more suited to the role than he realises. Brisbane, early November 2015. Australia has New Zealand 9/262 in their second innings and are on the verge of taking a 1-0 lead in the three-Test trans-Tasman Test series. Mitchell Starc, in one of those brain explosion moments he is prone to having, regathers the ball in his follow-through from a Mark Craig forward defence. Starc, for whatever reason, hurls the ball back toward the Black Caps’ tail-end batsmen, despite Craig being well away from the stumps and not really attempting a run. As the ball crosses the straight-ish fine leg boundary for four overthrows, the wide angle shot returns to second slip, where an incredibly frustrated captain stands with that oh-so-familiar hands-on-both-hips stance. The skipper’s glare had directed away from the overthrown runs and toward his bowler, who in his first moment of clear thinking in that instant, had turned away and walked back to his bowling mark. Starc escaped the glare, but not his skipper’s wrath in the post-match press conference. “I thought it was pretty disappointing. 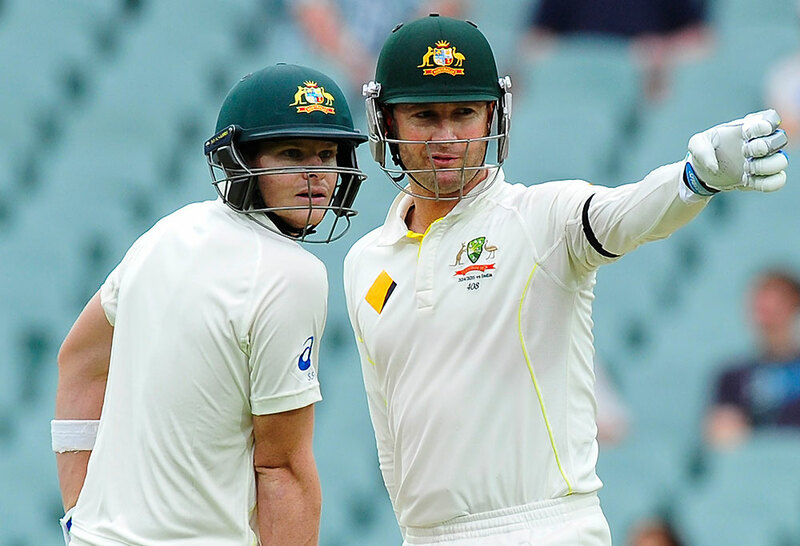 He’s done it a few times,” Smith said after the Test of the incident. Starc was fined $7000 from his match fee, but that was nothing compared to the televised and much-vaunted greasy stare, or the public roasting from his skipper. But after Smith had only a day earlier reacted somewhat angrily after a Nathan Lyon wicket, the Starc flashpoint had given rise to something much more interesting. Australian cricket suddenly had a new ‘Captain Grumpy’. The starts of the Border and Smith eras share several common links: a team in decline after a period of strength; bulk retirements that threaten to leave the team vastly inexperienced, and a potential for player turnover. The Australian team of the late 1970s and early 1980s was still reorganising itself after the two seasons of World Series Cricket, but whether wearing the actual Baggy Green or Kerry Packer’s gold cap, the players were still playing; still making runs and still taking wickets against the best players at the time. But when Border took over from Hughes midway through the 1984/1985 season, members of the Australian team were becoming well used to having their arse handed to them by the West Indies. The 1985 Ashes Tour to England was rocked by the withdrawal of senior players heading instead to South Africa, and the forced rebuild was on in earnest. Over the next few years, some very promising names were introduced into the Australian team – some of them ahead of their time. A least three of these players, Stephen Waugh, Healy and Mervyn Hughes, would go on to become greats of the game. The team Border handed onto Mark Taylor was ready to rule the world, and the subsequent handovers to Waugh and Ricky Ponting were of teams at the top of their game, carrying on unaffected by the change in leadership. After the aforementioned departures of Warne and McGrath, Ponting had to undertake a brief re-charting of the course back to the top, though the retirements of Adam Gilchrist and Matthew Hayden were much less damaging. When Clarke took over from Ponting after the lost 2010/2011 Ashes Series, future success for the team wasn’t that far away at all. Steve Smith has started his full-time tenure with a series win over New Zealand and a clean sweep against a West Indies side woefully lacking anything resembling world class. His side remains one in transition, however, and we will have to wait until it tests itself against South Africa, India, and England – and especially playing away to those countries – before we really know where Smith’s team will rank. Smith’s team could hold the world in its hand, or it could follow the path well-trodden in recent years: hometown heroes, but also-rans abroad. After the failed Ashes Tour, some welcome buzzwords were uttered. “If we pick young guys we just have to stick with them a bit and ride the wave,” Australian coach Darren Lehmann said, admitting that as selectors, they needed to allow players time to find their feet and show their worth. It’s a notion that more than a few state players in the early Border years would certainly have welcomed. By the midway point of the summer, that ‘pick and stick’ mantra would be staunchly tested, with injury absences and high-quality performance by replacements meaning the selectors simply could not fit everyone into the XI when fit. Behind the Test bats, the players earmarked as ‘next in line’ have had varying degrees of First Class success, while the state batsmen genuinely piling on the runs get precious little airtime in discussions. Though the depth looks impressive in theory, that perceived strength might actually be an illusion undermined by prejudgements; an illusion also quickly found out by the onset of a few injuries. This proved to be the case among bowling stocks, with the sudden retirement of Mitchell Johnson and would-be spearhead Mitchell Starc untimely ruled out for the rest of the Australian summer. Suddenly, Australia’s bowling attack was built around a young quick who the selectors don’t think can get through six Tests in an Australia summer without a rest. There was a Victorian workhorse who wasn’t sure he’d ever wear the Baggy Green again in the month leading into the game, and a younger, quicker Victorian quick who had just undergone a significant action rebuild and admitted he could break down at any point. Behind them are numerous sets of impressive First Class bowling numbers, but varying reasons for their overlooking are easily found: too slow, too expensive, not angry enough, not enough sleeve tattoos. And when selectors are making reasons not to pick performing state players, the illusion of depth suddenly becomes clearer and more alarming. Border had to deal with this same problem when he first took over, and the start of Smith’s captaincy journey also coincides with the end of another ‘superstar’ era. Taylor, Waugh, Ponting, and Clarke could all call on genuine match winners within their sides, and the names read like a roll call of bedroom posters through the ages: Boon, Hughes, McGrath, Warne, the Waughs, Hayden, Lee, Gilchrist, Johnson, Hussey, Harris. Even Ponting and Clarke themselves. Smith will have David Warner, and his own classy game, but very little else in the way of a match winner. And the trade-off of the lack of match winners is the nervous anxiety that comes with young players trying to cement themselves in the side. Smith will know this; you really don’t have to go back too many seasons to find one SPD Smith playing for his place in the national squad, worrying whether being earmarked as a blonde kid who could bowl leggies would hurt his aspiration of cracking centuries in the Baggy Green. Even if the depth is significantly shallower than it’s perceived to be, this nervous anxiety means that Joe Burns, Usman Khawaja, the Marsh brothers, Peter Siddle, James Pattinson and anyone on the periphery will still be playing with one eye looking over their shoulder. Adam Voges’ 2015/2016 form is such that he can now play out the end of his international days on his own terms while wicketkeeper Peter Nevill’s solid start to Test cricket and an evident lack of competition of an equal standard for his place means he’s similarly safe. Nathan Lyon is the leading Australian offspinner in the history of the game, and a very consistent career that is now beyond 50 Tests has finally worn down the few remaining questions regarding his place in the side. Mitchell Starc and Josh Hazlewood look like they will be the mainstays of the attack going forward, whenever they can stay fit. So when Smith is needing to call on his players to play out of their skin on any given day in the next 12 or so months, he must know that around half the team will have in the back of their mind that if they fail, the pressure on their position mounts. It means that this period of rebuilding could again lead to a turnover of players. When Mitchell Johnson retired, he was the last of the Australian Test player numbers in the 300s. 398, to be precise, with his debut coming against Brisbane in 2007/2008. Chris Rogers was 399, and Brad Haddin 400. Peter Siddle now holds the lowest number of any current Australia player, 403, and Smith follows at 415. A glance up and down the list of debut numbers gives an idea of just how stable the Australian team was for the best part of two decades. Work backwards from Haddin’s 2008 debut, and the previous 25 Australian players go all the way back to NSW tweaker Gavin Robertson’s 1997/1998 debut against India in Chennai. That’s 25 debutants in just over ten years. The previous 25 players again track back to one SK Warne at no.350, in Sydney in 1991/1992. Forward from Haddin’s debut, the next 25 players came in just three-and-a-half years; Starc (425) debuted with Pattinson (424) and Warner (426) in the 2011/2012 Brisbane Test. It’s a similar timeframe forward to the current wave of debutants: Voges (442) and Nevill (443) coming in 2015. So while 50 players debuted in a bit over 18 years from the end of the Border reign to roughly three-quarters the way through Ponting, another 43 players have debuted in the seven years since Haddin. If dominance brings stability, then perhaps it’s time to ready ourselves for a period of selection volatility in the coming years. Smith does, at least, have one significant advantage over Border, as he embarks on this rebuild, in that Cricket Australia is in a much better financial state than was the case in the mid-1980s. 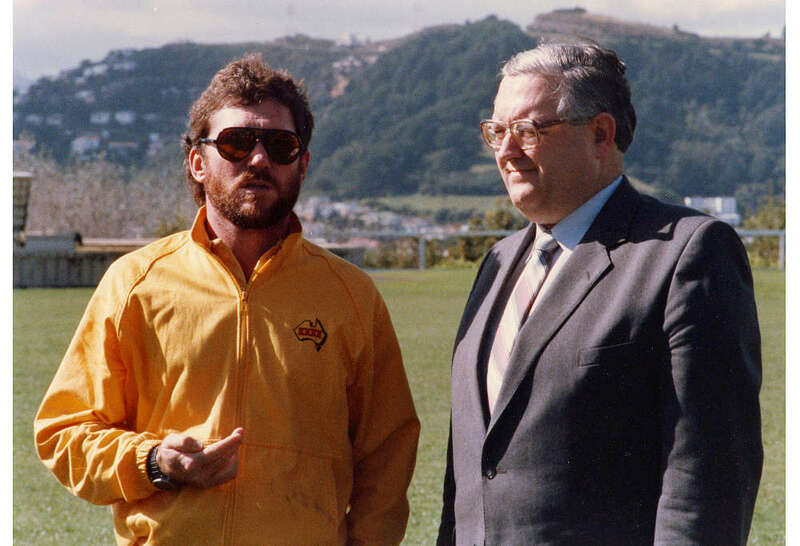 I have an endearing memory of Allan Border sitting on a balcony somewhere during the 1993 Ashes Tour of England, wearing that ever-present yellow XXXX visor and what Australian rugby legend Tim Horan confirmed for me recently was one of his early Wallabies jerseys. A player wouldn’t even entertain the thought of wearing their favourite football team’s jersey in the change rooms these days. Until the early-90s, when the commercial benefits of replica kit were discovered, players were lucky to get even just an Australian Cricket Board (as they were then known) polo shirt. Any sponsor apparel – like AB’s much-loved and well-travelled visor – was very much a matter of whatever the sponsors could muster. Sponsorships at the time were more relaxed, but also required more of the players; it’s hard to imagine a current Australian cricketer repeating Merv Hughes’ iconic XXXX ad appearance, with beer froth dripping from his legendary mo’. In his 1989 Ashes Tour diary, Border revealed he quite enjoyed the novel concept of flying to England in Business Class for the first time ever; “I liked the sound of Business Class. I thought it was fitting; ‘Aussies means business’ had a nice ring to it,” he wrote in Ashes Glory, his account of that historic tour that marked the arrival of his team in Test Cricket. Now, Qantas is entrenched as the ‘Official Airline of Cricket Australia’, which it also extends out to naming rights of overseas tours. Business Class is the norm, and twin share hotel rooms have given way for quality apartment-style accommodation. In this day of near nine-figure profits, though, nothing that might help the team win is out of the question. In Border’s time, it was the senior players and newly-minted coach Bob Simpson who would iron out technical issues. Specialist batting and bowling coaches were unheard of, and though team managers had always been around, physios and doctors and the like generally only accompanied overseas tours. Nowadays, Darren Lehmann’s off-field team comprises a specialist batting, bowling, and fielding assistant coaches, a doctor, a physiotherapist, a psychologist, a strength and conditioning coach, a performance analyst, a team manager, logistics manager, a media manager, and a whole team looking after social media, video, and online content. Indeed, the whole off-field team is now known as the ‘Bupa Support Team’, complete with corporate backing – and all the brand emblazonment that comes with it – after health fund Bupa elected during the off-season to move its commercial partnership money away from the Sheffield Shield and toward the new $29 Million National Cricket Centre (the ‘Bupa NCC’, if you will) located, coincidently, at the Allan Border Field in Brisbane. If a player in Smith’s team has an issue now, there are all manner of resources available to rectify the situation, be it technical, physical, or indeed, mental. Border maintains to this day that he got everything he possibly could have out of his natural talent and work ethic, but you do wonder how good a player he might have become, or how good his team might have become were he playing now with all the modern trimmings? Teams rebuilding is nothing new in Test cricket. Even since Border retired from the game, every other team in the world has had to go through the same sort of regeneration, and some countries have done it several times under several captains. Indeed, some countries have done it several times under the same captain. Australia was never going to be immune to this, and if anything, it’s a wonder it’s been avoided for as long as it has. Ponting went through something of a rebuild post-Warne-McGrath-Langer-Hayden-Gilchrist, but unlike Ponting then, Smith doesn’t have senior and established players like Clarke, Hussey, Haddin, Johnson, and Harris to call on. The likes of Burns, Khawaja, Marsh, Nevill, Lyon, and Hazlewood don’t yet carry the same gravitas and the previous roll call. The rebuild looks easy now, of course, in a summer featuring a closer-than-the-scoreboard-reads series against New Zealand and a very lacklustre West Indies, but there will be times in the next year or so when Australia loses a Test series it wouldn’t have lost in the recent past. The World Twenty20 and tours to New Zealand and South Africa loom ominously. Inevitably, the search for a scapegoat will be on, and while a young, rebuilding team might be spared, it might not necessarily be the case for coach Darren Lehmann. Already, Lehmann has nailed his colours to the post with his declaration that Australian fast bowlers must be regularly topping 140km/h; a policy that has had Peter Siddle, languishing just shy of 200 Test wickets, beginning to wonder if ‘former Test player’ was a label that applied to him. It may apply soon enough anyway, once 140 practitioners Starc and Pat Cummins return to full fitness. The policy also means that worthy practitioners of the bowling craft at Sheffield Shield level are being, and will continue to be, seemingly ignored outright. Strike rates and economy at First Class level mean nothing if the second number on the speed gun isn’t a four as a minimum. And that’s fine that a coach would want to develop a blueprint playing the game at International level, but that blueprint is immediately limited if you exclude a sizable chunk of your talent pool. The ability of batsmen to play the moving ball remains a primary concern; a deficiency that was laid to bare in England during the 2015 Ashes Tour. Smith’s double century at Lord’s and Chris Rogers’ haul of 480 runs at 60.0 in a bowlers’ series were the highlights in an otherwise unflattering show reel of hard hands, immovable feet, and chronic impatience. Every failure to adapt to conditions, particularly in overseas conditions, must fall at the feet of the coach. Lehmann is great for a sound bite in the media, and he certainly has a good record of motivating players and improving team cultures from his vast playing experience, but what about his technical coaching nous? What are Greg Blewett’s credentials to be an international fielding coach, other than being a very good fielder in his playing days? And if he is so well credentialed, why is fielding extraordinaire Mike Young still needed for short term consultancies? Bowling coach Craig McDermott had the quicks bowling fuller lengths when he came on board five seasons ago, so as to maximise the opportunity of the ball to swing. It worked to devastating effect in the home series against India in 2011/2012, yet the Australian attack consistently fails to extract anything in the way of swing and seam movement in English conditions. As head coach, these are all questions for which Lehmann is ultimately responsible. How much do we know about Smith as a captain yet? Certainly in his opening foray in the job, he appears to employ a similar attacking preference to his predecessors, but does he really have the ‘cattle’ to be able to play that way? It was easy for Clarke, Ponting, Waugh, and Taylor to play aggressively; they all had the players to back their instincts as captains. But even attacking captains need to play pragmatically on occasion, and the question as to whether Smith declared too late in Melbourne against India was asked more than once. The same question might have applied for the Perth Test against New Zealand this season, too. Early declarations were a luxury that Border certainly didn’t have, not while he was enduring the aforementioned thumpings from the Windies anyway, and Smith would be excused for conservatism around declarations as his team looks to establish itself. There will always be elements of chance and opportunism with declarations, but it will be interesting to observe Smith’s instincts in the coming years. Captains are judged by their assertive declarations in modern cricket, and Smith won’t always have all the trumps in his hand when playing top teams. Allan Border at least had six years and 63 Tests by the time he inherited the captaincy from Kim Hughes, but Steven Smith finds himself learning how to be Australian captain at the same time he’s learning how to be a senior player within his side. The Boxing Day Test this summer was Smith’s 38th, with all but five coming in the last three years since his March 2013 recall to the side. The captaincy had little impact on Border’s personal game, maintaining that consistent 50-51 average for the rest of his playing days. On an admittedly small sample it seems the © next the Smith’s name on the team sheet is sending his game to new heights, already adding 14 to his average while he’s been skipper. Smith should retain a superior winning percentage to Border as captain over time, but Smith won’t have to worry about as many quality opponents as Border did. When Border undertook his rebuild, Australia was very much a middle of the road side, surrounded by teams who could genuinely beat anyone. 75 of Border’s 93 Tests as captain came against England, New Zealand, India, and the West Indies, and he led Australia in only one three-Test series home and away against each of Pakistan, Sri Lanka, and South Africa. He never played against Zimbabwe or Bangladesh. Border drew more Tests than he won against New Zealand, India, the West Indies, and Pakistan as captain, while his win and draw records against Sri Lanka and South Africa were level. Smith is yet to lose a Test at this early stage of his tenure, but whether this remains the case depends entirely on how successful the rebuild is. Though Smith awkwardly laughs off suggestions that he is already walking down a famous path of leadership, those spotfire moments this summer, and an already well-developed look of annoyance show that he leads his team as much by emotion as instinct, and possesses an excellent ‘cricket brain’. 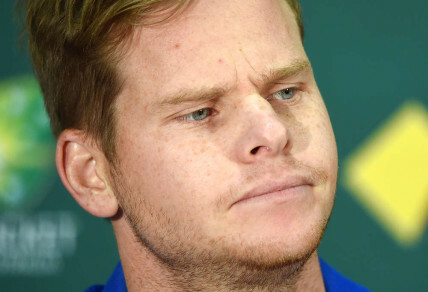 Given the size of the rebuild he’s undertaking, it’s fitting, then, that Darren Lehmann has revealed this summer that Smith is already known within the change room as ‘Captain Grumpy’. It might just take another grumpy captain to take this team to a sustained stint at the top.